New environmental regulations required Smurfit-Stone Container Corporation's Panama City, FL, mill to make significant plant modifications. Smurfit-Stone utilizes a Micro-XL system to control its bleach plant, digesters, lime kiln, water treatment plant, and pulp mill evaporators. It was determined that the most economical solution for controls would be to upgrade the existing Micro-XL to CENTUM CS 1000 and utilize CENTUM CS 1000 equipment for the required retrofit and expansion control requirements. The five Micro-XL field control stations at the bleach plant were replaced with five state of the art, CENTUM CS 1000 controllers. The controllers were the enhanced type and completely redundant. To simplify engineering and improve troubleshooting, new software included control drawings, control status drawings, logic drawings, and logic status drawings. The bleach plant's four Micro-XL MOPS operator stations were replaced with four PCs and Yokogawa operator keyboards. The CENTUM CS 1000's open system architecture allowed Smurfit-Stone to improve data acquisition and reporting capabilities with a long term data archiving package and Yokogawa's Microsoft Excel-based report package. Smurfit-Stone engineers Greg Cypher and Mike Sapp attended the ten day Yokogawa CENTUM CS 1000 engineering class and then solely implemented the CENTUM CS 1000 solution. Mr. Cypher and Mr. Sapp recreated all trend groups, control groups, and new graphics. They also manually converted all the Micro-XL controls into CENTUM CS 1000 control drawings. The entire conversion was completed in less than eight weeks. Six weeks were spent designing new graphics screens while the actual application conversion took less than two weeks. Yokogawa loaded the four PCs, assembled the hardware, and performed a Factory Hardware Test in Newnan, GA. Yokogawa engineers then helped Smurfit-Stone load the actual project software and perform a three day Factory Acceptance Test. CENTUM CS 1000's Windows NT platform and Yokogawa's commitment to retain the same Micro-XL look and feel, allowed the operators to easily adapt to and accept the new PC based CENTUM CS 1000. Yokogawa start-up engineer, Natalie Zurita, utilized CENTUM CS 1000's virtual test function to train the Panama City Mill operators on the actual project screens without disrupting the ongoing hardware installation or system checkout. Smurfit-Stone management was very concerned about completing the conversion in the short nine-day outage. Smurfit-Stone mill management was convinced that replacing the antiquated Micro-XL would be a risky task. Thanks to the combined team effort, the project went so smoothly that management circulated a letter stating how pleased they were that the bleach plant started back up on time without a single hitch. 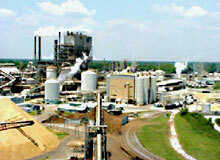 Smurfit-Stone plans to continue by expanding the plant with four additional controllers and another operator station. Over the next few years Mr. Cypher hopes that he can convert the remaining three Micro-XL systems to CENTUM CS 1000. Mr. Cypher stated that if he had his way, the entire plant would be converted to Yokogawa's CENTUM CS 1000. When asked how the CENTUM CS 1000 compares to the other systems on site, he stated that "there is no comparison, the other systems just don't have the tools!"